Prasar Bharati Jobs Recruitment Notificaition 2018.Prasar Bharati, DoorDarshan inviting applications for the positions of Section Officer.Interested and Eligible candidates can apply for the positions. Last Date for Submission of Application is on September 13th, 2018.. 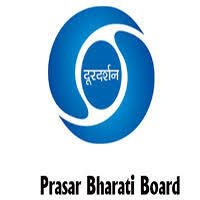 Filling up of fourteen vacancies of Section Officer on deputation basis in Prasar Bharati. 1. Scale: Level 8 of 7th CPC [PB-2, 9300-34800 + Grade Pay of Rs.4800 / -(pre-revised)). 2. Eligiblity: 2. Officers under Central Government and Autonomous Organizations following Central Government Rules/norms/proceduresjpay scales etc. i) Holding analogous post on regular basis m the paren t cadre in PB-II+ Grade Pay 4800 or (i) Having three (03) years service in PB-2 i.e. 9300-34800 ;, +4600/- on regular basis in the parent cadre/Department; And (iii) i Possessing thorough knowledge of secretarial practices, rules and regulations and practical experience of their applidation in Central Government/Ministry /Departmentj Autonomous" Organisations and also having experience in Administration, Finance/Vigilance matters. Age: The officers should not have crossed the age of 56 years as on the closing date of receipt of application for the above mentioned posts. (i) Certified copies of up-to-date and complete Annual Confidential Report(APAR/ CR Dossier) of last five years. (iv) List of minor/major penalty, if any, imposed on the applicant during last 10 years. The terms & conditions and pay & allowances of the officers selected for appointment on deputation basis will be governed as per the provisions contained in Government of India, DOP & T O.M. No. 6/08/2009-Estt(Pay.II) dated 17.06.2010, as amended from time to time. The initial period of deputation shall be for a period of 3 years. The period of deputation including period of deputation m another ex-cadre post held immediately preceeding this appointment in the same or some other organisation on deputation of Central Government shall ordinarily be for a period of three years. Applications complete in all respects should be forwarded through proper channel to Deputy Director (PBRB), Prasar Bharati Secretariat, Prasar Bharati House, Copernicus Marg, New Delhi.Last date for receipt of application is 21 days from the // date of publication of the advertisement in the Employment News.